Landscape LED Fixture accents trees, water features, signs or facades. The 309-10LEDML bullet landscape flood is a 10-watt, 120-277 volt fixture with a medium flood beam with a 3,500K color temperature. Provides universal aiming in wet locations. 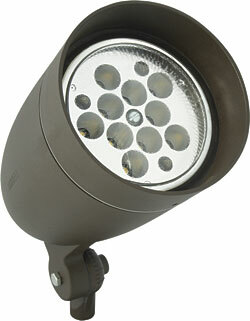 The die cast aluminum housing is available in a dark bronze finish.